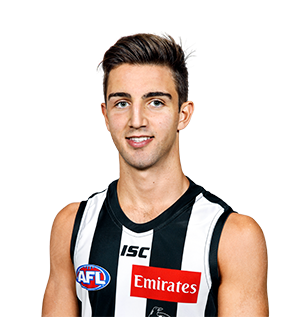 Josh Daicos is one of four players added to Collingwood's 25-man squad for Sunday’s clash with Adelaide. 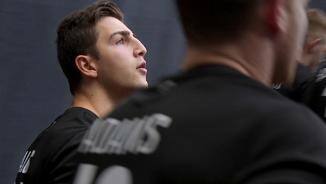 The son of Collingwood champion Peter Daicos, Josh’s untapped potential came to fruition in his first year in Black and White. After spending his childhood as a member of the father-son academy named after his father, Daicos built a solid resume playing for the Oakleigh Chargers in the TAC Cup, and then for Vic Metro in the 2016 National Championships. He became a Magpie and subsequently debuted at the MCG in round 22, much to the delight of the dedicated supporters who marvelled at his father’s skills years prior. Few draftees, let alone those selected with pick no.57 have arrived at the Holden Centre with the hype surrounding Josh Daicos in the off-season of 2016. Luckily, the exciting small forward had the help of his mate and fellow father-son Callum Brown to share the experience with as the pair settled to life as AFL players. Despite a slight frame, Daicos more than held his own through pre-season training, aided by a sharp skillset and strong football brain. He experienced a first taste of AFL action against Essendon in the JLT Community Series, before plying his trade with the VFL Magpies in the early stages of the regular season. While a Daicos playing on Victoria Park was enough to please the most hardened Collingwood supporters, for Josh it was an opportunity to stake a claim for a positon in the senior team. He averaged 16 disposals a game under VFL coach Jared Rivers, while kicking a goal per game and impressing with his tenacity and tackle pressure inside forward 50. When Daicos was selected as the Magpies’ travelling emergency for a round 21 clash with Port Adelaide, a senior debut seemed imminent. It would come quickly. The 18-year-old was presented his Black and White stripes the following week by fellow small forward Jarryd Blair, and debuted in front of 47,889 against Geelong at the MCG. A week later, he kicked his first goal against Melbourne and was showered in Gatorade as he sung Good Old Collingwood Forever alongside Brown and fellow first-year player Kayle Kirby.